I have been making something the past few weeks that has me completely exhausted. And as of Christmas my secret is out so I thought it was time to share it with you all. This little project is 11 weeks in the making with 29 left to go :) Any quick guesses? Yep. I'm pregnant. I am starting to feel a quite a bit better but still really exhausted. I have to apologize for ignoring the blog the past few weeks. It was all I could do to keep my 14 month old clean, fed, and safe. I never thought that the idea of sitting behind a computer would make me want to vomit but that is where I found myself. 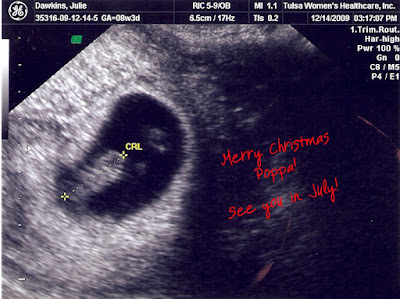 This is how we told the family..."Merry Christmas Poppa! See you in July!"